The 24-Fiber Singlemode Quad LC to MTP Cassette from LightWave provides you with a quick and easy solution to the space management challenges that data and networking centers are facing as throughput demands continue to rise. 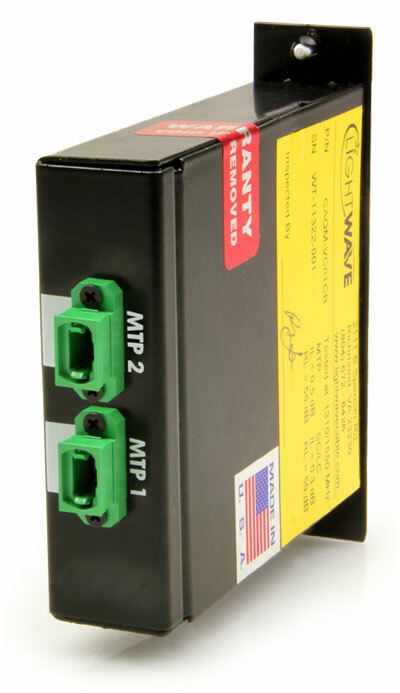 Control your telecommunications room more efficiently with this compact MTP cassette. These Singlemode 9/125 micron optical cassettes are fiber adapter panels with pre‐terminated and pre‐tested fiber harnesses already loaded in the cassette. By plugging an MTP brand cable into the back, 12 connections are lit up. Using this particular cassette with Quad LC connectors, two 12-fiber MTP/MPO cable assemblies are used.. The cable connects to another MTP brand assembly inside the cassette that "fans out" to 6 quad LC connections. The advantage MTP cassette apart from other Singlemode cassettes of this type is the "Elite" design, which significantly improves insertion loss quality due to its construction for tighter tolerances. Better insertion loss quality leads to improved performance, ultimately helping you to execute your applications more efficiently. The cassette can be snapped into any standard fiber optic patch panel including both rack mount and wall mount. A RAC-1X holds three of these cassettes which could potentially contain 72 active LC connections using only six MTP/MPO cables.